Electronic shelf labels are being tested at Walmart Store No. 1 in Rogers on Walnut Street. The technology is on the cereal aisle only. 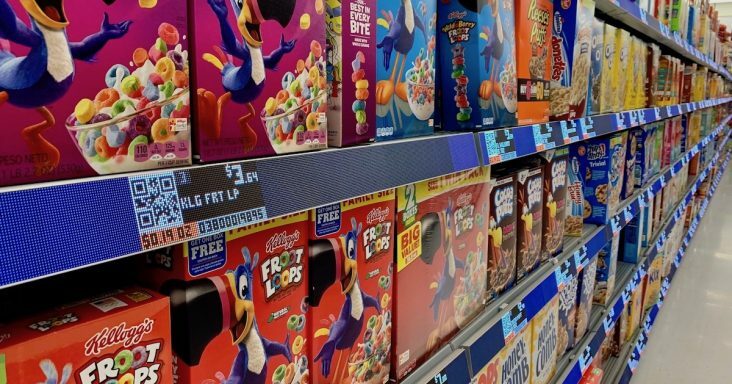 Consumers who purchase cereal at the Walmart Supercenter on Walnut Street in Rogers will see a new iteration of electronic shelf labels (ESL) that make price adjustments automatically as dictated by store management. 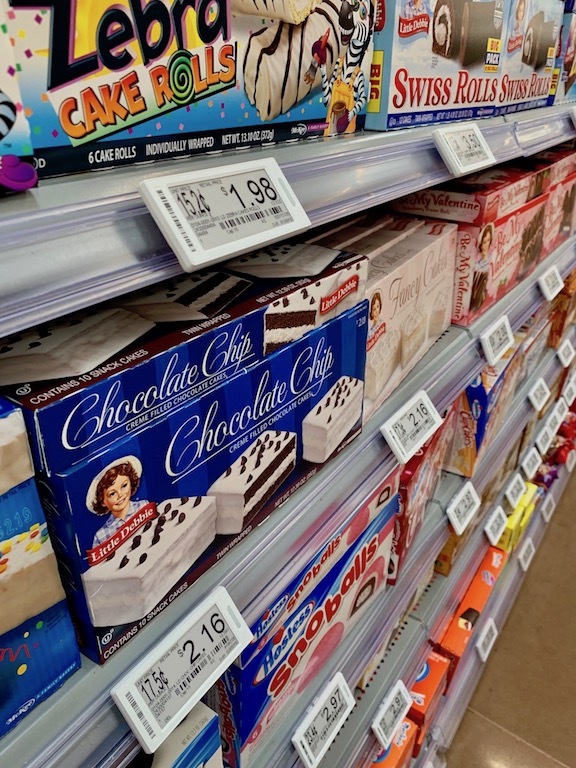 It is one of two digital shelf label technologies being tested by the retail giant in Northwest Arkansas. At Walmart Supercenter on Pleasant Grove Road in Rogers, the bread and baked goods aisle also has digital shelf labels that look more like the paper version. Walmart said this is a small test in concert with help from an outside partner. Walmart officials told Talk Business & Politics the company is testing two different types of shelf labels for the same concept which is to see if electronic shelf labels can be controlled through programming as quickly as price changes. The Pleasant Grove Road Supercenter is testing the electronic shelf labels to see if it saves time for employees and can provide accurate, real-time pricing for customers. “In an ideal environment, ESLs would communicate with other technologies in the store,” Walmart corporate spokesman Ragan Dickens said. He said the store often tests new technology applications to see if it’s viable for the rest of the business. He said the company is also looking to test ESL technology in a Neighborhood Market store to see if it’s right for the smaller store format. Walmart is also testing another version of electronic shelf labels on the bread aisle at Store No. 5260 at Pleasant Grove Road in Rogers. This technology is expected make prices changes easier and more accurate. The labels on the bread aisle at the Supercenter on Pleasant Grove Road are individual tags that would cover the price of a larger shelf area of merchandise like bread. The other style of labels in Store No. 100 are designed for densely populated shelves with multiple items and fast-moving products, according to Dickens. Talk Business & Politics spoke with store workers at the Walnut Street Supercenter as they were stocking the cereal aisle. The electronic shelf labels are affixed to shelf fronts. The fronts of these digital labels hang down twice as long as the traditional shelf front. This wider front restricts the shelf space up to two inches. One worker said the labels make it harder to stock the larger boxes of cereal that hang up on the shelf overhang. He said the boxes fit on the shelf but they have to go in at an angle. He said customers also have a harder time removing larger boxes. The digital tags do have a QR Code that if activated could provide shoppers using the Walmart app with more information about the product such as nutrition, how ingredients were sourced or perhaps a promotional coupon. 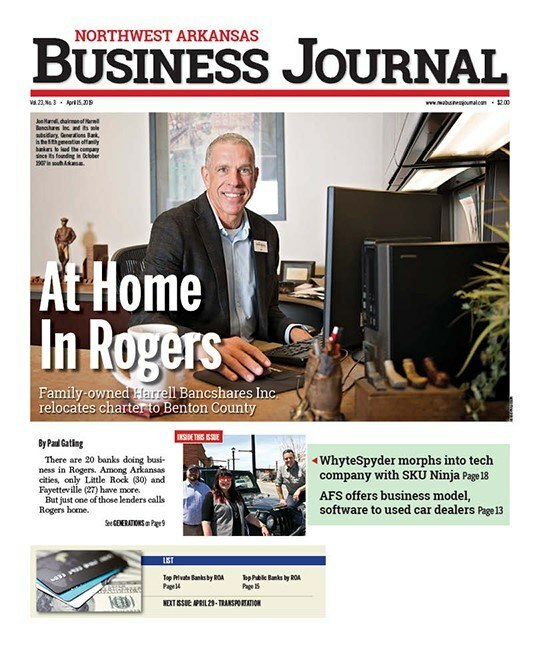 Bryce Paden, co-founder of i2i Labs in Rogers, said his firm has experience with ESL use. He said electronic shelf labels have been in retail since the late 90s, but new forms of technology and pressure to create new retail experiences have more companies testing them. Paden said there are two big form factors for the technology being tested right now. “One form is 3-color e-ink displays. These often feature displays as you would find on an e-book. They can either be black and white text, or have 3 color options – red, yellow and black. These systems are typically battery powered and most resemble current paper price labels you would see on a shelf,” Paden added. He said there has been recent growth in making the entire shelf edge digital, not just the price labels. “The Walmart test in [the Walnut Street Supercenter] is a good example of this technology. This form factor includes an LED strip mounted over the entire length of the shelf edges. Since this technology used LED strips, they are full-color, and they can do things like play ads, show product reviews, and more,” Paden said. Insiders said Walmart previously tested ESLs in the general merchandise area of a few stores. One problem reported with those early tests was consistent connectivity within some areas of the store. There was also a report of the tags not allowing a price-change to be made. Some store workers said if electronic shelf labels work as they are supposed to it would be a time saver for department managers who sometimes spend an entire shift on making price changes after a rollback promotion. The electronic labels would have to be durable, given the abuse the shelves take from customer carts and routine wear and tear in a heavily trafficked store. Paden said common hurdles for the retail industry using ESL has been battery life. He said technology is improving and could accelerate the adoption of ESL technology. Walmart competitor Kroger recently partnered with Microsoft to test digital shelf labels in a store in Cincinnati and one near Microsoft in Redmon, Wash. This test involves the two stores being filled with digital shelf labels that also have image recognition cameras. A customer can scan the QR Code into their smartphone and access promotional data, nutritional and dietary information. Kroger’s Microsoft Edge Shelf labels will also allow shoppers to connect to the retailer’s Scan, Bag, Go service. Walmart abandoned its scan and go tests last year, but Sam’s Club receives positive consumer reviews from the convenience its skip-the-checkout service provides members.